Spintso Referee Watch can be preset to any number of periods and any length of time per period, making it the perfect watch for adult, youth and indoor games. Spintso’s unique Stoppage/Injury timer function makes it also the preferred choice of College and High School referees. 2018 version with a Reset Button on the back! 2 Year Extended Warranty, exlusively at Referee Store! 1st Press & Hold starts the match and the relevant timers. 2nd Press & Hold (after conclusion of first half) starts the second half and the relevant timers. Initiating Stoppage/Injury Timer during any of the periods will pause the Count-Down Timer and start Stoppage/Injury Timer separately on the same screen - perfect for temporary match suspensions due ti inclement weather or extended stoppages due to serious injuries, etc. Restarting the match will save/continuously display the amount of time lost. The watch will vibrate to remind the referee every start and stop occasion during the match and when each period ends. The watch will also vibrate, every 10 seconds, when Stoppage/Injury Timer is activated. To preserve the watch's intended functions of all timers, always preset the watch to 1 extra period than the game for which it will be used (e.g. 3 periods for a typical 2-Halves match). Need replacement parts or service? Call us at (855) 697-6223. This watch is a terrific timepiece for any soccer official. Once you take the time to learn how it works and how to set it up, it is a huge help in keeping time and the handy features allow you to add time and manage it accurately. The vibration feature is really helpful when time expires and you are following the play. Highly recommend. Best watch I've ever had. - Sometimes the start button is difficult to press (nearly impossible with gloves). Since it has vibration feedback, you don't have to look at it. - Uses FIFA timing (additional time), not stoppage time, so if you're doing a high school or college match, you may want to use a standard stopwatch instead. Otherwise, the one touch operation, vibration, large display, count up, down, additional timers make this the best option available. The watch is pretty large and this is the only Spintso watch that has the vibration function. I find that function much more helpful than the beeping which players can hear and whine about the end of half or the game. This prevents their ability to know when my watch says time has expired. Also, the vibration alert every 10 seconds when you have the time stopped to deal with injury/cards/celebrations is very helpful. This reminds me to restart the clock so I won't be more than 10 seconds off. It took a few games to get the hang of this though since it takes 2 seconds of pressing the start/stop button to restart the clock. If the 10 second reminder vibration goes off during this 2 seconds, you have to make sure you keep holding the button down. Since the 10 second reminder and the restart of time is the same vibration pattern, I thought I had restarted the clock occasionally even though I had not. The only other issue I ran into is the band seems to be made for people with wrists that are huge. When tightening the band to the next to last hole, I'm not able to put the end of the band into the band loop's locking mechanism. If I put it in the locking mechanism, the band would have a weird gap between it and the other side of the band so I push the band through the loop and don't use the locking part of it. 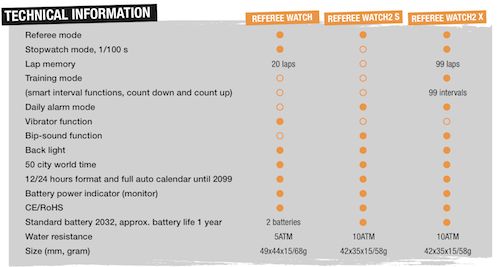 Having said all of these things, this watch is the best referee watch that I have used during soccer games. This is by far the best time keeping piece There is. Easy to set, reset and manage in general. I'm really happy with it. I believe this to be the best referee watch out there. It's simple to setup, operate, and see while refereeing. The only reason I didn't give it 5 stars is because it doesn't have GPS and HR tracking. Sure, you can get GPS watches with apps that provide that additional functionality, but you sacrifice battery life (it goes from years with this watch to hours). I use this watch as my primary watch with a GPS watch/app as my backup. It took me a while to finally take the plunge and buy this, and I wish I had bought this watch when I started out. I think this watch should be a component of every serious referee's kit. By making your watch similar to a Apple Watch screen. All these problems of DST, 1 second holding of down button (is a waist in College and High School games. Need to have a choice on 1 second or no seconds), light to see in dark will be much better and also can give a choice of a 3 second or 5 second or 10 second reminder vibrate. The band is excellent and the size of the watch. please switch to a full digital touch screen and button watch. Please give an option to turn off the touch screen and only use the buttons. 1 - DST (Daylight Saving Time) is a feature ONLY available in regular watch mode, NOT in Referee Mode and most find it really useful as we transition between DST from time to time. 2 - The 'Press and Hold' rather than just 'Press' in order to change the watch screen or activate/deactivate referee features is designed on purpose to avoid any accidental presses during the game. It is a safety feature much loved by all who purchase it, especially in HS and NCAA matches where the stopping of the clock is so common. 3 - Backlight does exist on Spintso watches, but I understand you would like to have options of changing its duration (feature request we will pass along, along with others you mentioned). Nice watch, the numbers are large, easy to read, the times are simple to set, large side buttons for operation, and so far has been useful. If you are a new referee, I would suggest you start with the $10-$40 watches because they will count down and most will give you an audible alarm. The biggest difference for me is this watch vibrates, has no tone alarm for match play, and has a setting for number of periods and timer for between halves. I'm still on the fence about how well this performs over the less expensive watches, but we'll see when I get some inclement weather to put this watch through the test. Great watch to use when reffing rugby. Large viewable screen. Keeps track of any time functions associated with rugby...i.e. each half, sin bin, etc. Highly recommended! This watch is the gold standard for referee timepieces. The silent vibrating alarms are great to let you know that it is time for the half, time to start the second half and the end of the match without anyone else overhearing a beep. Also the count-down and count-up timers on the same screen make determining which minute it is and how much time is left in the match or half extremely easy. That half second it normally takes to do that math is eliminated. This is very useful for referees who do multiple competitions where the length of match varies. The only two complaints I have about the watch, and whyou I couldn't give it five stars, are that the periods you program into the watch all have to be the same length and that it is too easy to switch back and forth from daylight savings time to standard time. The period programming should allow for you to plan for extra time at the beginning of the match and not require you to reset the watch after full time has elapsed. For example you should be able to enter the two 45 minute half with a 15 minute halftime interval, followed by two 15 minute halfs for extra time where there is a two minute break. Or whatever the timing needs to be for the given competition. While it seems like a minor complaint Spintso has already thought of nearly everything else, why not include this feature? As for my second complaint, it only takes one quick press of the lower left button to switch the watch from DST to standard time. Perhaps the fix is as simple as requiring a long press for that change, however it is very easy to inadvertently switch your time back and forth and this is the second reason why I can not give a full five stars. Overall this is the best watch I have seen and used for refereeing and I would recommend it to all referees, despite my two complaints.